I can see the rationale for sticking the ports on the back of the USB hub: it keeps the cords hidden. But what if keeping them in plain sight meant you could cut the power to each device individually? 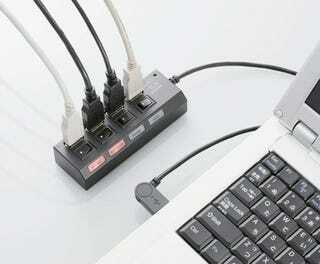 That's the idea behind Japanese company Elecom's latest attempt to re-engineer the humble USB hub, a power strip-esque block with ports facing skyward and a switch dedicated to each one.